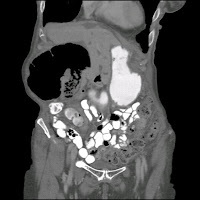 am I imagining it, or can I actually see the appendix on that ct? Of academic interest only... Do you ask your patients for permission to publish their images and/or story? Please understand. I am not making any accusation what-so-ever. It is clear that there is no patient identifiable information. I just really want to your expert opinion on the matter, as you have been blogging for sometime now. Impressive. Hope the outcome was good. i don't see the appendix. "i don't see the appendix." And yeah, pretty much de rigeur for the CT to be done prior to surgeon consult, as you know.